Odell Jehu. Kirksey came from a family of doctors. His grandfather, Dr. C. L. Kirksey practiced in the late 19th century and was also a Methodist preacher living near Dover, Arkansas. His son Dr. Robert J. Kirksey graduated from the College of Physicians and Surgeons in Baltimore in 1891 and lived in Cross Creek, South Carolina. Later he and his wife, Lou Taylor Kirksey, lived in Oenaville, Texas. It was there that Odell J. was born on April 11, 1894, the third child of the family. When Odell was a year old the family moved to Dover. Odell graduated from high school in Dover, then attended medical school at Kansas City College of Medicine and Surgery, graduating in 1919 having served as president of his class. He joined his father in practice, who had moved to Owasso, Oklahoma. A few months later, in 1920, the young Dr. Kirksey moved to Mulberry, Arkansas to begin his own practice. 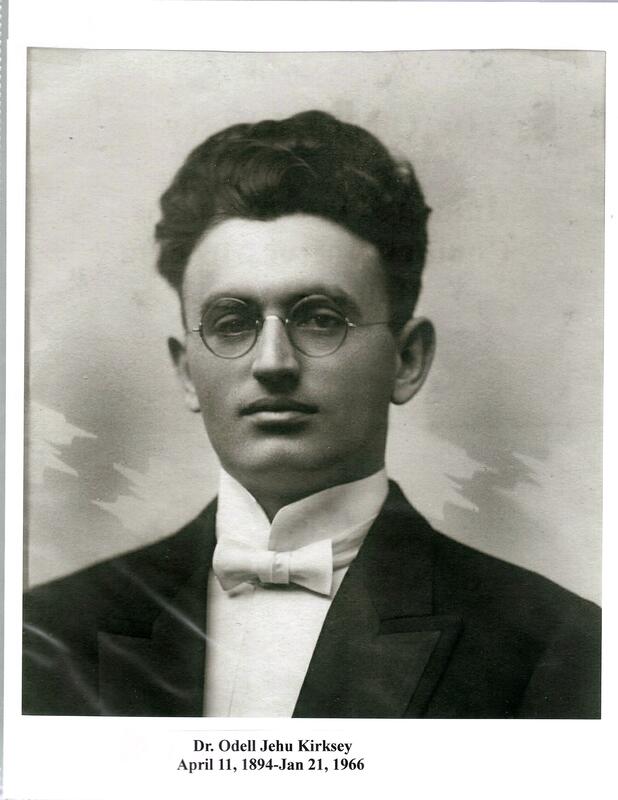 In June 1921 Dr. Kirksey married Blanch Cruger from Owasso. The couple had three children: Ozell, born in 1924, who was killed in WWII; Avenelle, born in 1926, who became an honored, professor/researcher of nutrition at Purdue University; Joe, born in 1929, who became a noted farmer/rancher/civic leader. The Kirksey Family owned a small farm on the edge of Mulberry where they raised a few short horned cattle, had Tennessee Walking horses and a small grain crop, with help from a couple living on the farm. Dr. Kirksey was an ardent fisherman in the Mulberry River close to the homestead. Dr. Kirksey’s first medical office was in a downtown Mulberry building. Later he moved to the back of Counts Drug Store and then to a small house (built circa 1900) on 4th Street. His final office, a large 2-story house was bought from Dr. A. S. Koenig who stayed only a short time in Mulberry. However, in 1945 Dr. Kirksey enlarged and converted the small 4th Street house into an eight-bed maternity hospital,*** possibly because of the post WWII baby boom. Most of his deliveries before had been in the home. In his long years of practice he delivered more than 4700 babies. He continued his obstetrical practice until 1960 when he was 66 years of age. Dr. Kirksey was active within the city of Mulberry, (growing at that time, 1920 pop. 1,095). He was a charter member of Mulberry’s Lions International, a member of Remy Masonic Lodge and was a Director of the Bank of Mulberry. He and his son donated land for the Mulberry City Park. Professionally he was a member and past President of the Crawford County Medical Society in 1934, 1940, 1947, 1951, 1955, 1959, 1962, member of the Arkansas Medical Society and the American Medical Society. In 1952, to honor the doctor, the City of Mulberry designed October 26-31 “Dr. Kirksey Week”. He was an active member of the Presbyterian church until it discontinued in 1956; thereafter he transferred his membership to the Methodist church, where he was also active, serving on the administrative board at the time of his death. Dr. Kirksey continued his general practice of medicine for 5 years after omitting obstetrics. He died suddenly at his office on January 21, 1966 at the age of 71 and is buried in the Mulberry Cemetery. His practice of medicine spanned 47 years. *Gloria J. Keiler, “Joe Myron Kirksey”, in Panning for Nuggets of Old, 2014 Fall Issue (Crawford County Genealogical Society, Inc.) 78. ***In 2009 the City of Mulberry received a $92,000 matching grant to restore the old Kirksey Maternity Hospital as a museum and community center. Much volunteer work, community pride and participation went into the project. The century-old refurbished building on the National Register of Historic Places was opened to the public on June 29, 2014.